We've seen the chimpanzees' relationships change in their almost-six years of sanctuary, and we've witnessed their social intelligence grow - especially that of Burrito and Annie. The reward of seeing a well-adjusted group of beyond-middle-aged chimpanzees that spend a lot of their time playing with each other is immeasurable. One aspect of chimpanzee caregiving that can be challenging is making sure that you are not interfering in the relationships among the chimpanzees in your care. At Chimpanzee Sanctuary Northwest the seven chimpanzees live with each other 24 hours a day, everyday. The social relationships they have with one another are arguably the most important part of their lives. They provide each other with comfort, companionship, and support - in ways that we humans just cannot. 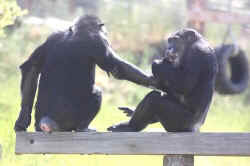 Just like with humans, relationships between chimpanzees are dynamic and multifaceted. So, when Negra suddenly decides she will demand a portion of Missy's breakfast (Negra is the queen, after all), or when Jamie decides that it is definitely not the appropriate time for Burrito to play with a caregiver (it is no exaggeration to say that Jamie is the boss of us all), or when a fight breaks out in the group (all primates fight! ), we caregivers generally just step back, monitor the situation, and make sure everyone remains safe and healthy. This requires that caregivers be able to read the social scene and understand not just the hierarchy of the group, but the individual social dynamics within the group as they are changing. It's a fascinating job, really.